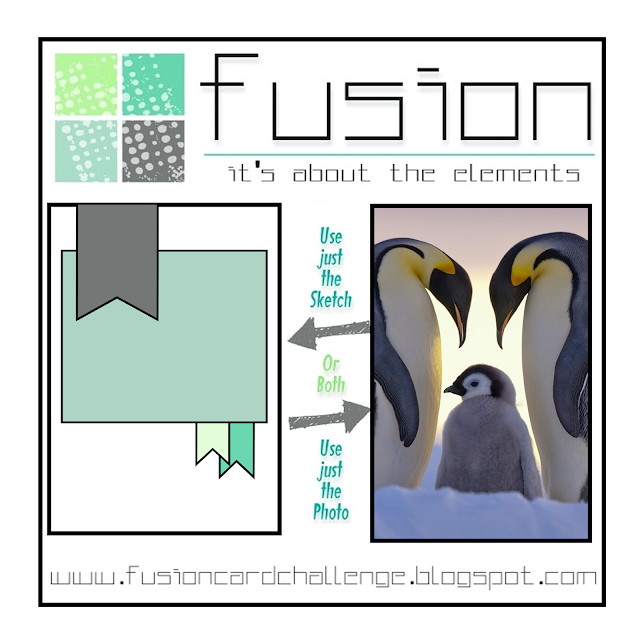 Here's my card for the current Fusion challenge. 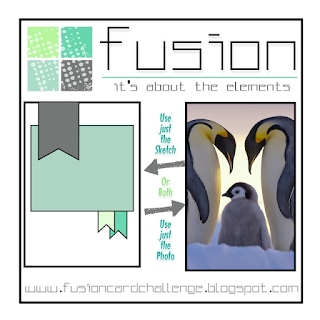 I combined the sketch with the penguin theme and blue tones of the inspiration photo for my sweet design. My penguin is from Hello Bluebird's adorable Skating Party stamp set. I colored the image with Copic markers, then used my Scan 'n Cut machine to cut out the image. I made a background for the image from light blue cardstock for the sky and a shimmery white curved panel with stitched detailing serving as the ice. The penguin was added on top using foam tape for dimension. I matted the panel on dark blue cardstock before adhering it to a plaid patterned paper panel. I cut several fishtail flag strips from two shades of blue cardstock, then arranged them above and below the image panel. 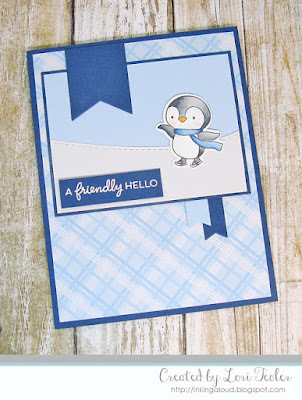 The "a friendly hello" sentiment from the Fall Friends set was heat embossed in white on a narrow dark blue strip for the sentiment--covering where my attempt to stamp the sentiment in black directly on the somewhat slick shimmery paper failed... The finished panel was adhered to a blue card base to match the mat beneath the image panel. This is so pretty done in all shades of blue! S2eet as can be! Glad you share it at FMS! Great card Lori! Love how you used both the sketch and the inspiration photo!